Wow, February is zipping by me at lightening speed! We had the younger kidling's birthday party with a Candyland Theme, complete with a green-screen Candy Tram ride that Chris whipped up in a few days. And we're still reeling from the sugar rush! Last weekend, through a harmonic convergence of getting caught up with my shop, a well-timed play-date and a technical rehearsal, I had the house completely to myself for 2 hours! 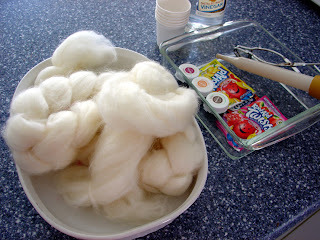 So I dug out some natural merino roving I'd bought ages ago and messed around with dying it. 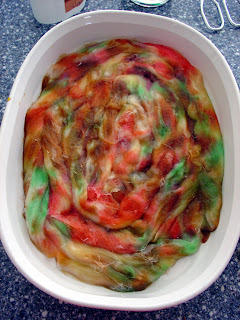 The kidlings and I experimented with Kool-aid dyes before so this time I added Wilton's Food Coloring Gels. I've had these for (literally) years, so some of them were kind of gummy. Next time I do this, I'll go buy some new jars. I used instructions from Keep On Knitting in the Free World and they worked like a charm. I ended up using Wilton's Brown, Copper, and Kelly Green along with Kool-Aid Lemonade. 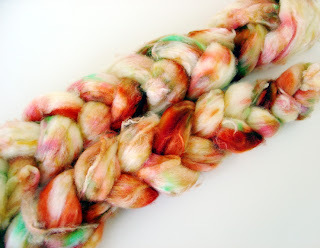 I like the colors together but wish I'd used two to three times more dye. I'm excited to spin it up, though, and see what I get! How fun to have a couple of hours just for yourself!